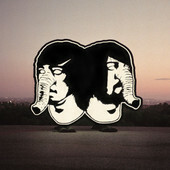 Death from Above 1979 made an immediate splash upon their debut in 2004 with You're a Woman, I'm a Machine. Bassist/synth player Jesse F. Keeler and drummer/vocalist Sebastien Grainger both hailed from Toronto, where they met and formed Death from Above in 2001. (The “1979″ tag was added later, following a spat with the U.S.-based music collective DFA.) Without a guitarist — or any other bandmember for that matter — Keeler and Grainger were free to push their rhythmic sound as far as it would go, and they eventually arrived at a severely overdriven rush of punk, hip-hop, and dance music influences held together with high volume. After issuing a few initial singles, Death from Above 1979 issued their debut album in 2004 and never looked back, touring alongside such high-profile bands as Nine Inch Nails and Queens of the Stone Age and generally making a sweaty racket wherever they went. Romance Bloody Romance, a collection of You're a Woman remixes, appeared in October 2005 before Keeler and Grainger officially announced their disbandment the following August, as the two had apparently grown apart over the recent years. Keeler went on to work with producer Al-P in MSTRKRFT, while Grainger launched a solo career under the moniker Sebastien Grainger & the Mountains. In February 2011 the duo officially announced that they had re-formed and by late 2012 they were performing new material on a tour of Canada. Although European dates in early 2013 had to be cancelled due to illness, by the end of that year they were back on-stage at venues closer to home. July 2014 brought their first single in nine years, “Trainwreck 1979,” ahead of a second album — titled The Physical World — which was planned for a September 2014 release. 3. Heads Up – E..
1. Blood On Our H..